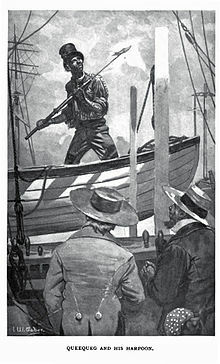 The precipitating manner in which Captain Ahab had quitted the Samuel Enderby of London, had not been unattended with some small violence to his own person. He had lighted with such energy upon a thwart of his boat that his ivory leg had received a half-splintering shock. And when after gaining his own deck, and his own pivot-hole there, he so vehemently wheeled round with an urgent command to the steersman (it was, as ever, something about his not steering inflexibly enough); then, the already shaken ivory received such an additional twist and wrench, that though it still remained entire, and to all appearances lusty, yet Ahab did not deem it entirely trustworthy. And, indeed, it seemed small matter for wonder, that for all his pervading, mad recklessness, Ahab, did at times give careful heed to the condition of that dead bone upon which he partly stood. For it had not been very long prior to the Pequod's sailing from Nantucket, that he had been found one night lying prone upon the ground, and insensible; by some unknown, and seemingly inexplicable, unimaginable casualty, his ivory limb having been so violently displaced, that it had stake-wise smitten, and all but pierced his groin; nor was it without extreme difficulty that the agonizing wound was entirely cured. Nor, at the time, had it failed to enter his monomaniac mind, that all the anguish of that then present suffering was but the direct issue of former woe; and he too plainly seemed to see, that as the most poisonous reptile of the marsh perpetuates his kind as inevitably as the sweetest songster of the grove; so, equally with every felicity, all miserable events do naturally beget their like. Yea, more than equally, thought Ahab; since both tie ancestry and posterity of Grief go further than the ancestry and posterity of Joy. For, not to hint of this: that it is an inference from certain canonic teachings, that while some natural enjoyments here shall have no children born to them for the other world, but, on the contrary, shall be followed by the joy-childlessness of all hell's despair; whereas, some guilty mortal miseries shall still fertilely beget to themselves an eternally progressive progeny of griefs beyond the grave; not at all to hint of this, there still seems an inequality in the deeper analysis of the thing. For, thought Ahab, while even the highest earthly felicities ever have a certain unsignifying pettiness lurking in them, but, at bottom, all heartwoes, a mystic significance, and, in some men, an archangelic grandeur; so do their diligent tracings-out not belie the obvious deduction. To trail the genealogies of these high mortal miseries, carries us at last among the sourceless primogenitures of the gods; so that, in the face of all the glad, hay-making suns, and softcymballing, round harvest-moons, we must needs give in to this: that the gods themselves are not for ever glad. The ineffaceable, sad birth-mark in the brow of man, is but the stamp of sorrow in the signers. Unwittingly here a secret has been divulged, which perhaps might more properly, in set way, have been disclosed before. With many other particulars concerning Ahab, always had it remained a mystery to some, why it was, that for a certain period, both before and after the sailing of the Pequod, he had hidden himself away with such Grand-Lama-like exclusiveness; and, for that one interval, sought speechless refuge, as it were, among the marble senate of the dead. Captain Peleg's bruited reason for this thing appeared by no means adequate; though, indeed, as touching all Ahab's deeper part, every revelation partook more of significant darkness than of explanatory light. But, in the end, it all came out; this one matter did, at least. That direful mishap was at the bottom of his temporary recluseness. And not only this, but to that ever-contracting, dropping circle ashore, who for any reason, possessed the privilege of a less banned approach to him; to that timid circle the above hinted casualty- remaining, as it did, moodily unaccounted for by Ahab- invested itself with terrors, not entirely underived from the land of spirits and of wails. So that, through their zeal for him, they had all conspired, so far as in them lay, to muffle up the knowledge of this thing from others; and hence it was, that not till a considerable interval had elapsed, did it transpire upon the Pequod's decks. But be all this as it may; let the unseen, ambiguous synod in the air, or the vindictive princes and potentates of fire, have to do or not with earthly Ahab, yet, in this present matter of his leg, he took plain practical procedures;- he called the carpenter. And when that functionary appeared before him, he bade him without delay set about making a new leg, and directed the mates to see him supplied with all the studs and joists of jaw-ivory (Sperm Whale) which had thus far been accumulated on the voyage, in order that a careful selection of the stoutest, clearest-grained stuff might be secured. This done, the carpenter received orders to have the leg completed that night; and to provide all the fittings for it, independent of those pertaining to the distrusted one in use. Moreover, the ship's forge was ordered to be hoisted out of its temporary idleness in the hold; and, to accelerate the affair, the blacksmith was commanded to proceed at once to the forging of whatever iron contrivances might be needed.